African Women in Agricultural Research for Development (AWARD) is pleased to announce that the call for the second round of the AWARD Pan-African Fellowship is now open. Applications from African women scientists who are citizens of Benin, Burkina Faso, Burundi, Cameroon, Central African Republic, Chad, Congo, Côte d’Ivoire, Democratic Republic of Congo, Ethiopia, Gabon, Ghana, Guinea, Kenya, Madagascar, Mali, Mauritania, Niger, Rwanda, Senegal, Tanzania, and Togo and have completed a bachelor’s, master’s, or doctoral degree in an agricultural discipline are invited to apply. agro-ecology and resilient seed systems. The AWARD Pan-African Fellowship was initiated in 2017 with support from the Agropolis Fondation, the Bill & Melinda Gates Foundation (BMGF) and the United States Agency for International Development (USAID) country missions. 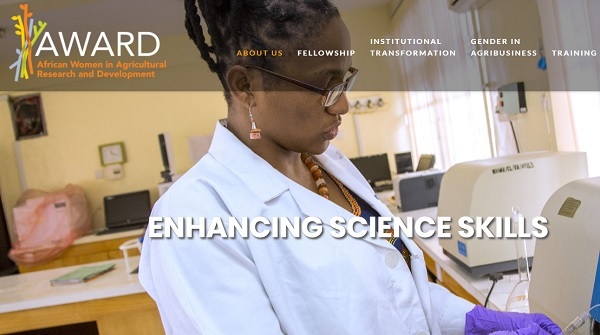 It seeks to extend the benefits of the AWARD Fellowship to female scientists from francophone Africa and to maximize interactions between English and French speaking African women agricultural scientists.